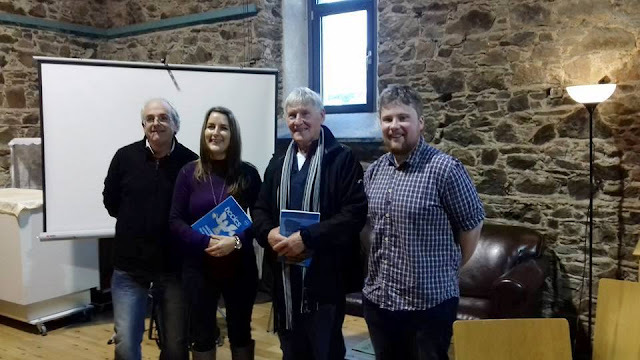 Photo: left to right: Donnchadh Ó Ceallacháin (Waterford Treasures), Chrissy Knight-O’Connor (Waterford County Museum), Eddie Cantwell​ (Waterford County Museum) and Cian Manning (Editor Decies). On Saturday 4th November Chrissy Knight-O’Connor and Eddie Cantwell, who are very involved in Waterford County Museum, were invited to Copper Coast Geopark in Bunmahon, County Waterford to talk about our Middlequarter Community research for the launch of Waterford Archaeological & Historical Society’s Decies Journal 2017. Chrissy gave an excellent presentation on Community Archaeology in Dungarvan starting with Gallows Hill and ending with Middlequarter investigations, a paper on the latter written by Chrissy Knight-O’Connor and Eddie Cantwell being included in the latest (73rd) edition of Waterford Archaeological and Historical Society’s Decies Journal 2017. Many congratulations to the both of them. Thank you to Cian Manning (Editor Decies), Donnchadh Ó Ceallacháin (Waterford Treasures), Knotted Cords and all at Copper Coast Geopark.